Hello! We continue our short story serial from the point our kid is still trying to figure out the root of the problem at home but his parents aren’t giving him any clues. 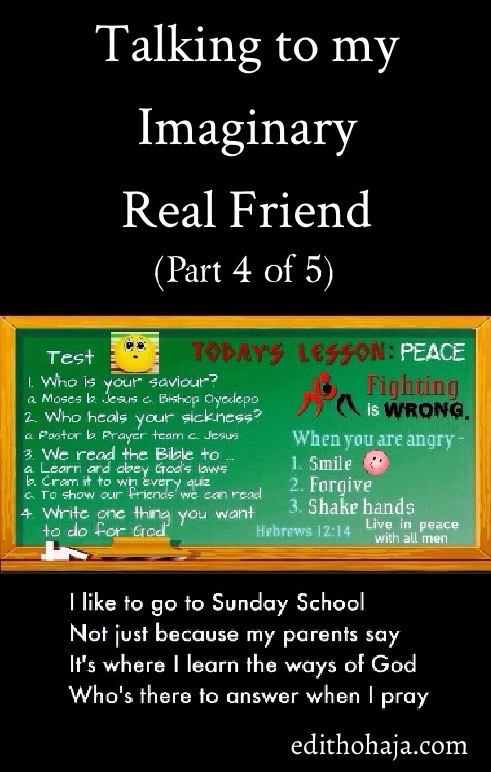 Has his imaginary real friend been of help? Let’s see. Oh and the experience of reading this episode won’t be complete if you don’t join the Sunday School class portrayed in the illustration. And attempt the quiz! Haha! Want to see how many adults will flunk the test that many six to eight-year olds will pass. I’ve just been dropped off by our neighbours. My parents let me go to church with them. They say it will be good for me. The children’s church is divided into classes and today, our teacher gave me the gift she promised when I joined her class last month – a Book of Bible Stories. Should be called Book of Bible Pictures as it has more drawings than stories. But I love it. The drawings have beautiful colours and I can read the words. I’ve finished the first story – “In the beginning”. Nothing too hard so far. I talked to God in church today. I told him about my mum crying and my dad angry and no one will tell me why. He said I should tell Mum Dad is leaving but it would only be for a while. I didn’t understand it but I wrote it down ’cause it seemed important. But I forgot to ask Him how I can get Mum to answer my question about the right time for her to have a baby or how to find out what she is hiding. I find my mum in their bedroom, crying again. She wants to say something but I beat her to it, “I know, you’re not crying.” She really starts weeping loudly and I’m confused. Poor kid must be so confused. Things are going topsyturvy at home. Should he keep talking to God? Can He actually help when his mum doesn’t even go to church? You can find the other episodes of this exciting story in Related Posts. “That is the best thing I have heard today,” she says, sniffing. “And you know what, I believe it. I have to believe it.” Hahaha... I am as confused as this little boy ooo. What exactly is she talking about! Time will tell sha. I think the little boy is on a very good track by talking and listening to God. And his mother's belief or faith or spiritual strength can never be a hindrance for God's manifestation through him to his family. I love the story, the suspense and the little boy's sharp mouth... Waiting patiently for the next episode. Well done ma! Thanks, Ani Bee! Trust you've been well. The next episode, I believe, will be the best. 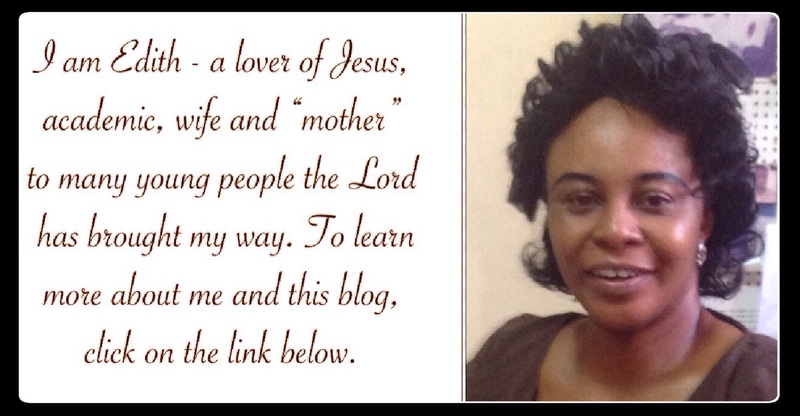 Subscribe to the blog to get email notifications of new posts. Subscription is free. Shalom! little ones sometimes receive solutions from God, especially here that the boy's parents appears not to go into HIS sanctuary often. Good one ma. can't wait to for the suspense to be cleared. waiting for the next episode. Love your comment. Hope you passed the Sunday School test. Lol! Nice, nice and nice. Eagerly awaiting the next episode. It'd be worth the wait by God's grace! She was desperate and God gave just the word she needed. wait on the lord , be of good courage he shall strenghten your heart wait I say on the lord. Awwww! You make me want to read the story again. Awwww. This little boy is truly a blessing. Can't imagine going to church without my parents at his age. God works in mysterious ways. The parents don't go to church but they allow him to saying it will be good for him. 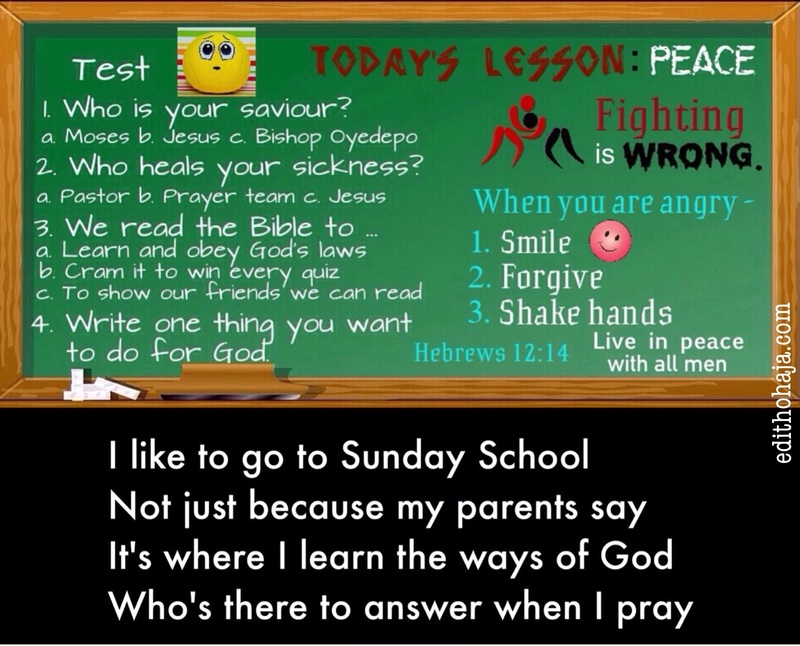 You didn't do the Sunday School quiz, lol! I'm loving this! Gift is quoting the Bible. Keep it up, my dear! From the looks of things, thus family has more secrets than they are letting on. See how God spoke to this little boy. God is indeed wonderful. God can speak to us in many ways. he does not care about your age, attitude, status etc. he just used this young boy to talk to his mother that one day everything will be alright. this story is really entertaining and educating. I am as confused as the little boy is. I wonder what is going on in the house. Children should be encouraged to attend Sunday school. I remember when I had my own copy of The book of Bible stories. Its nice of his parents to let him go to church even though they don't. Hmmmm, this is pitiful. I really feel for the little boy. Well, nice story and wonderful creativity. God has a way of working mysteriously,he spoke to her son here who is confused about the condition he sees at home and the boy loves his creator. He could help his mom especially now that the father has left the house by convincing her to go to God's house.